A few months ago we stopped at the Weigles gas station on Highway 411, northbound side, in Vonore, Tennessee. When we travel and have to stop for a bathroom/gas break I prefer stopping at Weigels since the stations and the restrooms are always clean and tidy. 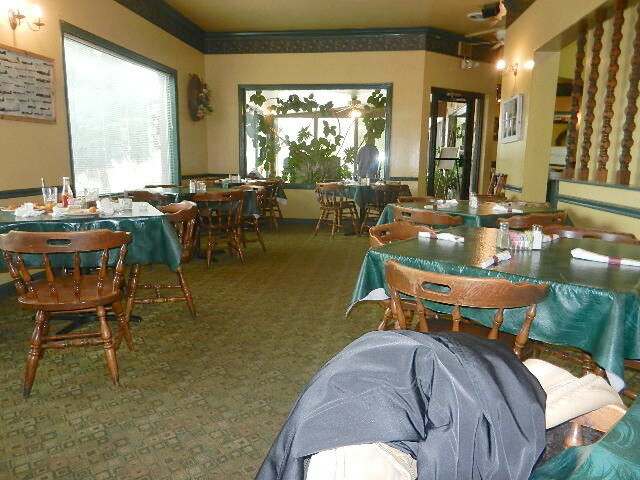 While my husband pumped gas I noticed a restaurant next door called Countryside Restaurant. It wasn’t time for lunch since it was early in the morning. I purposely remembered the name and looked it up when we got home. I not only checked out their website, but I also read a lot of reviews and they were all favorable. I said to my husband, “One day we’ll go there and check it out.” And so we did…. There is a sign out front but the restaurant does sit fairly back from the road and it blends in with the scenery, so be sure you don’t miss it. Just remember it is next to the Weigles in Vonore and you should be able to spot it. Last Friday we went to Countryside for an early dinner. We do dine early, that was something we started when we retired! When we entered we were greeted and told to sit anyplace. We took a table in the corner and there were two other tables with customers who were just finishing their meals. Once they left we had the place to ourselves, but don’t forget this was 3 pm on Friday afternoon! Our drink orders were taken and delivered and by that time we both knew what we wanted. My husband had the smoked prime rib sandwich with fries. I had the 8 ounce prime rib dinner with a salad and baked potato. The salad, I always ask for just lettuce, was fresh. The lettuce was crisp and the French dressing had a nice tang to it. Now on to the main courses…. I have to preface my next statement by saying that being from ‘up north’ we are used to most restaurants serving prime rib, good prime rib. Here in the south that isn’t often the case. But I will give credit where it is due and the prime rib at Countryside was good, on a scale of 1 to 10 I would give it an 8. I would have given it a 9 but it was cooked with a hint of garlic, not something I care for. 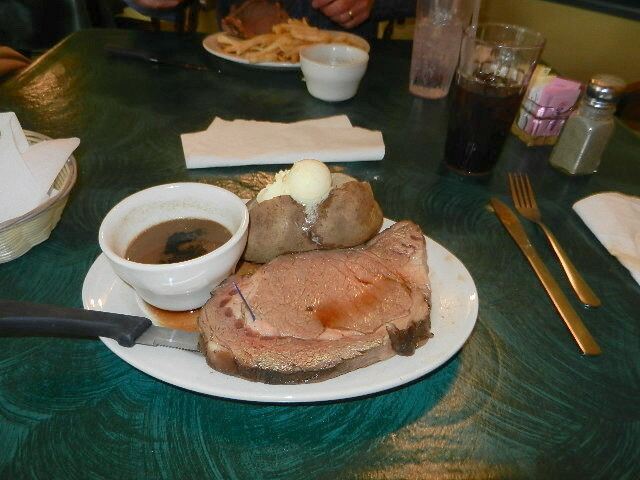 With that said, the prime rib sure looked bigger than 8 ounces! It was juicy and tender but it was just barely warm. The photo might make your mouth water! 8 ounce Prime Rib - very good! My baked potato was a little on the cool side, but with the salad and size of the prime rib I only took a few bites of potato anyway, so it wasn't a problem. My husband found the prime rib sandwich a little difficult to eat as a sandwich. Instead of thin sliced prime rib on a hoagie roll it was a ¼ slice of prime rib, which he wound up using a knife and fork on. After seeing my prime rib compared to his he knew he should have ordered the prime rib dinner too. Oh well, next time. Not only does the Countryside Restaurant have a very diverse menu, they also have two ‘all-you-can-eat’ choices daily: Fish and chicken 11 am – 4 pm for $9.95 and Fish and shrimp 4 pm – 9 pm for $12.95. Plus they have daily specials. To see their full menu check it out here. Once I bit into that prime rib I knew right then and there that we will be going back for more in the near future! If you have a hunger for prime rib (or anything else!) try Countryside Restaurant in Vonore, Tennessee. Open daily 11 am - 9 pm!